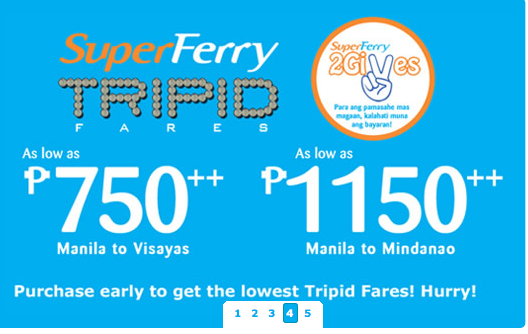 SuperFerry Promo Fares: Purchase early to get the lowest fares!!! Yes, Purchase your Super Ferry tickets as early as NOW to get the lowest TRIPID Fares offered to you by SuperFerry Philippines. 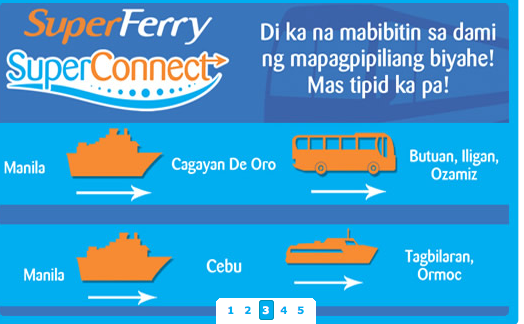 Now are you traveling between Manila to Cebu or any destination on a regular basis with Super Ferry Philippines? This is the Super Ferry Connect program. 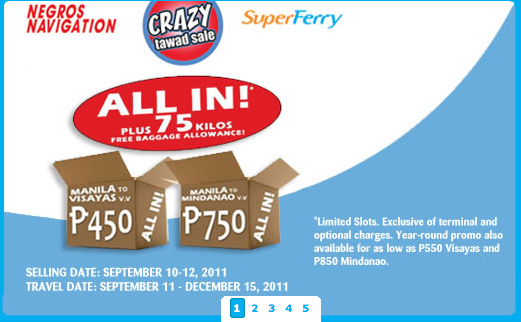 Now, check this site for more PROMOS and NEWS about SuperFerry Promo Fares. 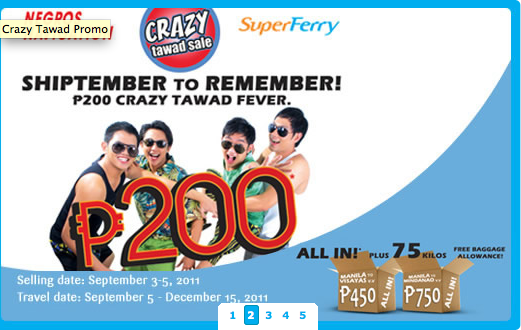 Bookmark this site to be updated with the latest promo from SuperFerry Philippines Promo Fares. So why don't you always check this page often for some Super Ferry Promo Fares? SuperFerry Fare: Tripid Fares are SuperFerry's year-round fares. Superferry Fare: Tripid Fares are SuperFerry's year-round fares. The most affordable rate can go as low as Php750 for Visayas and Php1,150 for Mindanao. Best to book early so you can avail of the lowest rate! Super Ferry: ELEVISION SETS of SuperFerry 20 and 21 are now installed by high definition cable channels provided by Cignal Digital TV. Cignal Digital TV, owned by Mediascape, is a subscription-based satellite television service provider in the Philippines which uses the NSS-11 satellite of SES Company to provide optimal coverage directly to target markets.